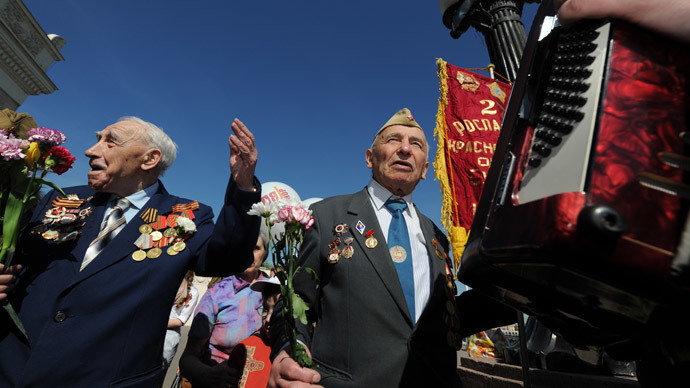 With a mixed feeling of joy and grief, young and old are flooding the streets all across Russia and former Soviet states to commemorate those millions who sacrificed their lives to defeat the Nazi invasion 69 years ago. Emotional embraces and red carnations are just some of the modern symbols of appreciation that thousands of veterans of the Great Patriotic War (how people in Russia and across the former Soviet states refer to the Soviet Union's victory over Nazi Germany in 1941-45) will receive in every corner of the biggest country on the planet. 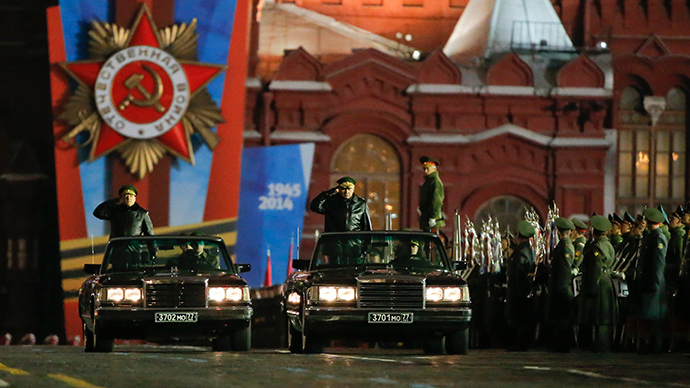 Parades big and small will of course showcase Russia’s current military might, but first of all will honor the sacrifice of some 27 million Soviet citizens who perished during the national struggle against Nazi Germany. 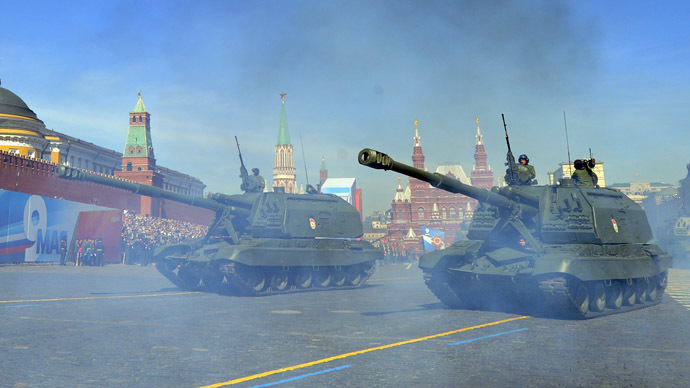 The main national parade, as always, is taking place in Moscow’s Red Square. More than 11,000 troops, 49 military vehicles and 69 warplanes will be on display for the spectators in the Russian capital. The parade marathon was kicked off in Vladivostok in the far east of Russia, home to the country's Pacific Fleet. After the procession of the armed forces, an "Immortal regiment," comprised of relatives of those who died during the war, reminded the onlookers of the faces of victory, by holding up pictures of deceased veterans. St. Petersburg, which marked the anniversary of liberation from the Siege of Leningrad this year, will also witness the parade on Palace Square followed by a procession of veterans and blockade survivors on the main artery of the city, Nevsky Prospect. Just like in Moscow and other cities across Russia, WWII-themed special exhibits will await the spectators on this truly national holiday. In the Hero City of Sevastopol – home to the Russian Black Sea fleet in Crimea – a total of 70 warplanes and helicopters will feature during the parade on May 9. 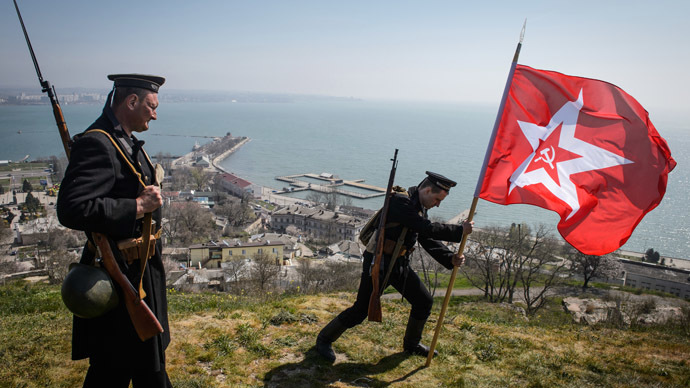 Afterward, a traditional Victory Day military parade will be held with more than 1,000 Russian navy officers and soldiers, Sevastopol's security forces and local military academies participating in it. Throughout the day, celebrations are held for war veterans. In Moscow, open air concerts have been organized in major squares with traditional veterans’ meetings held in the city’s parks. For those eager to taste wartime food rations, a field kitchen is offering samples in the center of Moscow. Similar commemorative events are planned all across the nation. 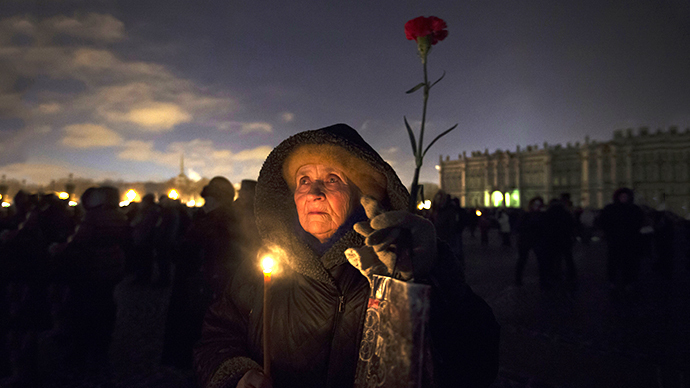 Traditionally, a minute of silence is also observed throughout the country, at 19:00 Moscow time (15:00 GMT). It was introduced in 1965 as a way to commemorate those Soviet soldiers and civilians who died in the Great Patriotic War. The day will be concluded with spectacular displays of military salutes and fireworks. Ukraine, which also marks the 69 anniversary of defeat over Nazi Germany, will commemorate the holiday in a more low-key way amid great tensions and a split in society. Most cities have canceled mass commemorations over fears that there may be violence from the ultra-nationalist Right Sector group, which opposes what they call a Soviet occupation and deny the historical importance of the Soviet multinational fight against the Nazi invaders. Earlier this week, Ukraine's government media watchdog urged TV channels not to include Russian war films or documentaries in their rundown. “If possible, refrain from any mass rallies, and in the case of participation in them, do not succumb to provocations. Demonstrate tolerance to flags, slogans, and other opinions,” coup-installed Prime Minister Arseniy Yatsenyuk said. The Victory Day parade will not go ahead in Kiev, as the head of the city administration is afraid of destabilization of the capital, blaming Russia for possible unrest. Law enforcement agencies were also asking people to avoid clashes and help maintain peace. 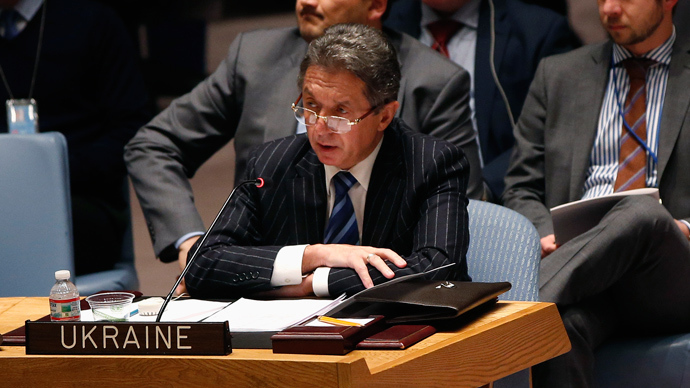 According to Bondarenko, all Ukrainian Security Service (SBU) officers have been placed on high alert. EuroMaidan paramilitary groups will also be keeping order. In western Ukraine, traditionally more nationalist, in the cities of Ternopol and Lvov, the display of all communist symbols and nationalist insignia has been banned. Military parades have also been canceled, as well as the traditional laying of wreaths of flowers next to the Monument to the Unknown Soldier. Yet despite the ban, the veterans in Lvov are still planning to hold their own commemorations. The head of the Lvov veterans association, Timofei Mahanyuk, told RT that, despite the ban, he and many of the veterans will fulfill their duty and pay their respects to their fallen comrades by laying flowers at their graves. Mahanyuk says that Lvov has become a "breeding ground for Ukrainian Nazism." He says that he and many of his veterans always face the possibility of being attacked. But despite a threat to their well-being, veterans will hold May 9 commemorations. In the southeast of Ukraine, some Victory Day events will take place, but celebrations are expected to be more low key once darkness falls. In Odessa, the scene of the May 2 deadly clashes, authorities will deploy over 2,000 security officers to ensure order amid fears of possible provocations. The parade has been canceled, but residents will have the opportunity to greet veterans, lay wreaths and watch firework displays. In Lugansk, the parade and the fireworks have been canceled, but residents will have the opportunity to show respect for all those who perished during the world's bloodiest war.